Last night my wife and I drove west the sixty-seven or so miles that it is from our home in Franklinville, New York to Chautauqua Institution. Chautauqua is one of those lovely contemplative venues that I love. Diane loves Bill Cosby and for her birthday in June I bought a couple of tickets to Saturday’s 8:15 performance. She and our children regularly watched the Cosby Show when it was regular series. I’ve liked Bill Cosby since I was a young boy. I can remember him starring on “I Spy” with Robert Culp. I remember seeing him on other television shows too. I remember that Bill Cosby wrote an endorsement for the Temptations on their “Great Hits” album. But, it wasn’t until after I purchased the tickets and read about him on Wikipedia that I realized that we had something in common. It turns out that we are both US Navy veterans and we both served as Hospital Corpsman. Diane thoroughly enjoyed the show. She laughed so hard her sides hurt. Thank you to Bill Cosby for a great evening. 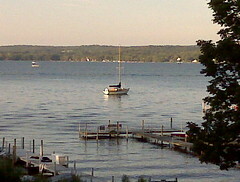 I used my new Blackberry Curve to take this lovely picture of Chautauqua Lake after Diane and I finished dinner at the Tally Ho. This entry was posted in Uncategorized and tagged Bill Cosby, Chautauqua Institute, comedy, Hospital Corpsman, US Navy. Bookmark the permalink.